Will I See YOU At LMCC17 In November?! Already hard at work adapting a popular talk on content marketing for libraries to update for 2017 and fit the needs of this year’s LMCC audience. Definitely check back to this post for slides, bonus handouts, and more. 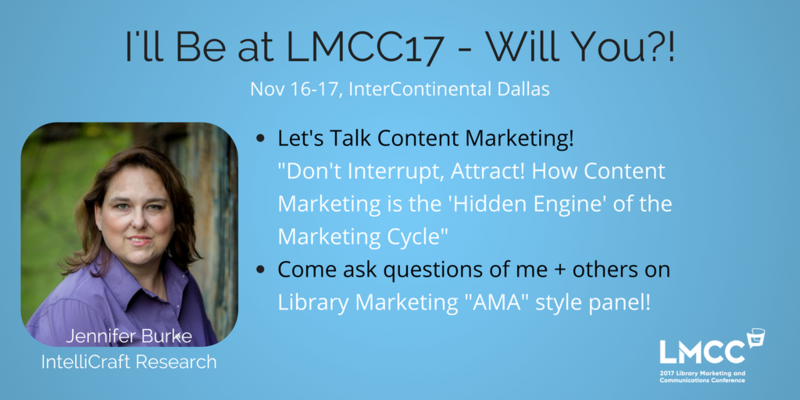 Plus, I’m thrilled to be joining some esteemed library marketing peers [Nancy Dowd, Kathy Dempsey, and Patrick Zinn] for what will be an “AMA” (Ask Me Anything) style panel on the Friday afternoon of LMCC17. Come ask all the burning marketing cycle questions you’ve been dying to ask someone! You’ve got your social media accounts, maybe a blog, some videos, and of course all the in-library marketing materials. You have content. But do you have a content marketing strategy? Let’s talk about the new paths of communications and how libraries can take advantage of content marketing. Have you made the shift from old-school “interruption marketing” to the new strategies of attract, engage, and listen? Let’s make sure you avoid common mistakes of content marketing! We’ll take the tactics you’re already using that are part of the content marketing cycle, and make them the “hidden engine” powering your library’s marketing cycle. As of late September, we’re nearing another sold out conference – we have <40 seats left, still time to grab one! So … will YOU be one of the 300+ library pros I see in the Dallas area November 16-17, for our third (!!) outstanding Library Marketing and Communications Conference?